Google Email Uploader is a tool created by Google to make the transition to Google Apps easier. 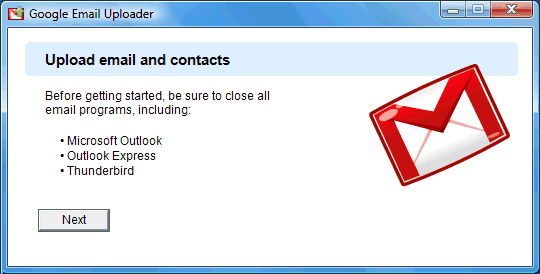 The application imports to a Google Apps account the messages and contacts stored locally in Microsoft Outlook 2002+, Outlook Express and Thunderbird. It doesn't modify the sent dates from your messages and it converts the folders into Gmail labels. Google Email Uploader is open source and it works only in Windows XP and Windows Vista. The uploader works only in the premier edition of Google Apps, even though Google says it should work in the standard edition, as well. If you try to use it with a standard Google Apps account, you'll get this error message: "you are not authorized to use this feature". The most likely reason why the application works only in the paid version of Google Apps is that it uses the email migration API, which "allows administrators and users of Google Apps to migrate mail from legacy email systems into their domain's hosted Gmail accounts". The API is enabled for the paid accounts and it's also used by gMOVE, a tool that migrates Outlook calendars, email, contacts and tasks to Google Apps for $19. You can also import old mail to a Gmail account using IMAP: simply drag your old messages to Gmail's inbox in an email client, but the new application should be more reliable. I thought you might want to check this out. Google Talk Labs Edition. To be honest, its pretty lacking in features. Seems to have fewer overall than the original talk for desktop. It basically is just the talk gadget as a desktop program. Dragging email from one IMAP account to another is fine if you only have a handful of messages. I tried to drag from GMail to GAFYD and gave up as there are unpredictable limits which kill tranfers. In the end I signed up for Premier, used the IMAP migration tool, then downgraded. It worked pretty well with just a little cleanup of labels required at the end. I just migrated about 7 years worth of mail from my old IMAP provider to my Gmail account, and I can tell you most unequivocally that your advice to "simply drag your old messages to Gmail's inbox in an email client" will NOT work very well. I spent a long time with Thunderbird and Mail.app finding this out the hard way. It may work for a while, but eventually it will fail, and you'll spend a long time figuring out which messages got copied and which didn't. It's a nightmare. Someone over at the excellent emaildiscussions.com forums gave this solution: Point Gmail's POP fetcher (under Settings/Accounts) to the inbox of your other account. Then, within your old account COPY the messages you want to move into the inbox (the one Gmail's pulling from). Tell Gmail POP to delete messages as it pulls them, and you should see your old inbox gradually empty out. If something goes wrong, you were working with message copies so you'll be able to recover. Now, Google Email Uploader may do just great, but it's not free, and the above method is. I just used emailchemy and pop3 importserver to move my old imap mail to google apps free account. The software is like $19 and $15 and worth much more. This is a great feature! Even if you still want to primarily use outlook this is a great way to backup your emails. Any hints on how to move Gmail to Google Apps Standard edition? I've been tryin different solutions and looks like POP import would work, but no labels (from Gmail to Google Apps mail) are mantained, what it is frankly, pretty annoying! Have a look at the Limitnone product called GFXer or something. I haven't used it, but came across a description of it when looking for something to move my legacy pst files into G Apps. It says on the tin that it does what you're looking for. Just read this post tonight, and tried the app right away before reading the rest of the post, or the comments. Glad I did! I only have the standard (free) edition of GAfYD, but it's importing all of my old email wonderfully! Awesome!!! Nope David, the product is still available and I'll be testing it this week. As far as I know, it's different to the Google Email Uploader - I thought that the uploader only took messages from Outlook into Apps. Just to be clear - I'm talking about http://www.limitnone.com/products.php?p=gxfer and I'm hoping to use it to pull some emails from a gmail account into a G Apps account. I don't mind losing labels, as long as the mails are in there to be searchable. I've been using gMove (for Outlook emails --> G Apps) for a week or two and it's ok - had serious issues initially with it aborting, but that seems to have cleared up. I transferred my 3 year mails to G Apps. I figured out if you remove any mail with attachments over 600KB, it works just fine without any hitch. attachment mails over 600KB has to be forwarded than moved. Even a single attachment halts the process. can i get back the deleted mails by google email uploader? Would you be able to update this blog, please, with the latest and best way of using the Email uploader to pick mail up into a Google Apps account. For me - I'm most concerned with taking mail out of Outlook Express and maintaining the folder/label structure... does anyone know if that's possible?